All office supplies, including vintage paper cutter. Shows some wear. Located in basement level, so two individuals will be required to remove. Also bring 2-wheel dolly to take item to the main floor. Chromaharp autoharp comes with carrying case; in like new condition! Heavy Metal storage rack; high bidder also receives everything shown on shelves. Located in basement level, so bring 2-wheel dolly to take item to the main floor. 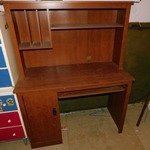 Includes 2 shelves; 78 x 33 x 18; this item is located in the basement. Located in basement level, so two individuals will be required to remove. Also bring 2-wheel dolly to take item to the main floor. Zero Gravity lounge chairs with headrest; in perfect condition - never used! Oak; top shows a little damage; top right drawer front needs track repair; 31 x 29 x 24. Located on 2nd level, so two individuals will be required to remove. Also bring 2-wheel dolly to take item to the main floor. Size large. Note: The white images are reflection from the sunlight when the photos were taker. Shirt is in very good condition. Green and cream check fabric. In excellent shape. Note the fancy leg design! Located on basement level, so two individuals will be required to remove. Computer or Office Desk. Located on basement level, so two individuals will be required to remove. Also bring 2-wheel dolly to take item to the main floor. 1 dresser size; 1 nite stand size; both need repairs, but have good construction. Located on basement level, so two individuals will be required to remove. Also bring 2-wheel dolly to take item to the main floor. Davis brand sewing machine in original cabinet; comes with contents of drawers. Located on basement level, so two individuals will be required to remove. Also bring 2-wheel dolly to take item to the main floor. Shabby chic cedar lined cabinet with mirror front; 71 x 38 x 20. Located on basement level, so two individuals will be required to remove. Also bring 2-wheel dolly to take item to the main floor.